So I went along and took advantage of the ‘power of time-off’. In the long run, we all want to find happiness, don’t we? At this point, I was quite sure that I had quite a good steak in the happiness pie, and I took this as a chance to test my assumptions. 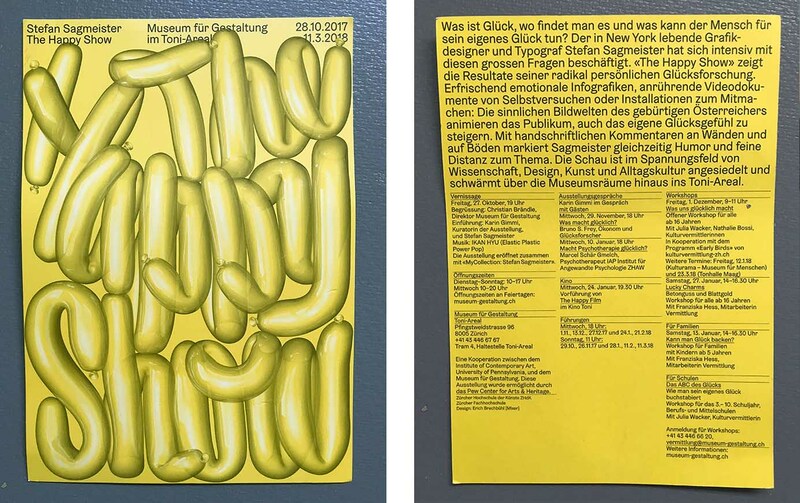 I always enjoy a visit to the ‘Museum für Gestaltung’ and the Toni Areal, as I myself once attended the ‘Vorkurs’ (Foundation) in Zurich, and I have extremely fond memories of drawing alphabets, studying typography, experimenting with form and challenging my skills. So if in this case, I was to find a new approach to how I perceive design, then that would suffice for the day. But a challenge is always good and I am merely grateful that someone asks questions, especially about 'happiness', to challenge my belief systems. I liked the brochure accompanying the exhibition which is now sitting in my office: "1.2 This exhibition will not make you happier." (This managed my expectations), "2.1 Now is better", "2.11 Happiness breakdown" etc. Then a list of self-help tips which are useful to keep for the future. This is where I am currently at in my life as a designer: The sensing that more can be done with design than selling products. That, in fact, more must be done. What that ‘other’ was, I still had to define. 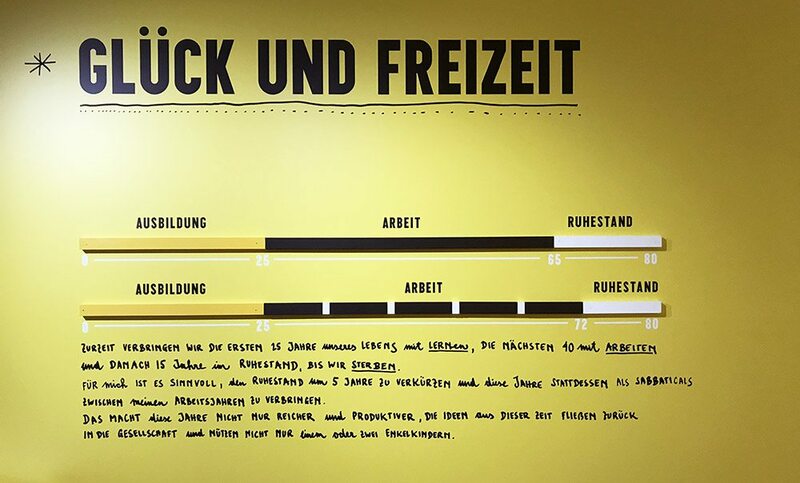 So I engaged and participated in some of the exhibition’s surveys and let myself be immersed in some of the questions Stefan Sagmeister asked in this ‘happiness research’. Some insights were challenging, such as the observation, that we learn for 15 years, work for 10 and then spend 15 years in retirement until we die; and therefore it may be a good idea to shorten the retirement period by 5 years and use this time as sabbaticals during our working lives. It reminded me of the times I spoke to my teenagers about finding a hobby and how they could and should make that to their profession, as this would/ or could be a path to happiness, or a path to a happier work life. 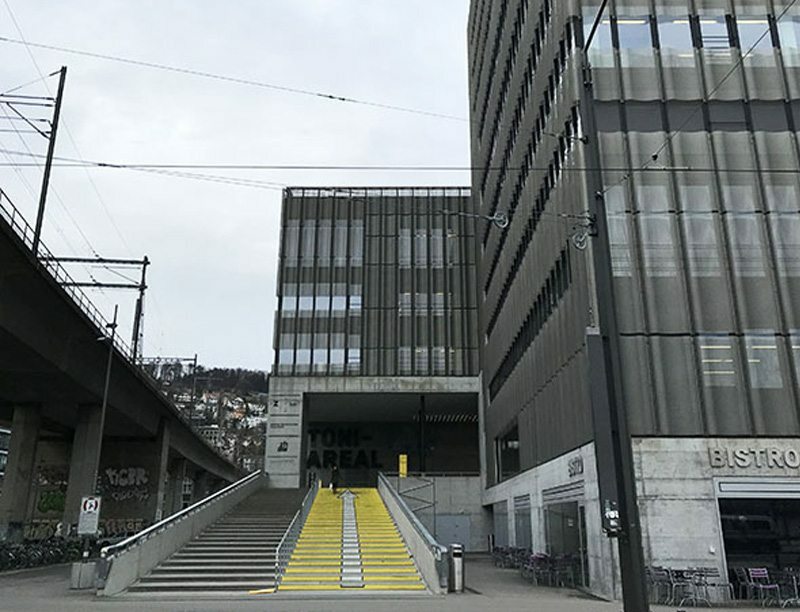 In the sabbaticals, Stefan Sagmeister has been taking time off to explore projects with content that don't have to earn money. This seemed a great idea, and to experience what he discovered filled me with excitement. I appreciated the invitation to be active and interact with the exhibition. ‘"Find a reflection of yourself and tell it what you really think." I liked the question, if there may be any tools to achieve happiness and how we could train the brain to draw from achieved happiness at a later stage like a source of power. But it only touched me on the surface. Some of his tips were useful and I carried them away with enthusiasm to implement. Personally, I feel that timeout could be taken in much smaller junks, letting everyday life leap into the creative process. As a working mother, I experience that taking time off to pick up the kids from school offered perspective on what I had been working on; coming back to it gives me the valued distance to make better judgement calls, and I often feel empowered to make more concise decisions. Was I fortunate enough to have a close transition between work life and ‘time out’? Or is my design work compromised because of the interspersing interruptions of family life? 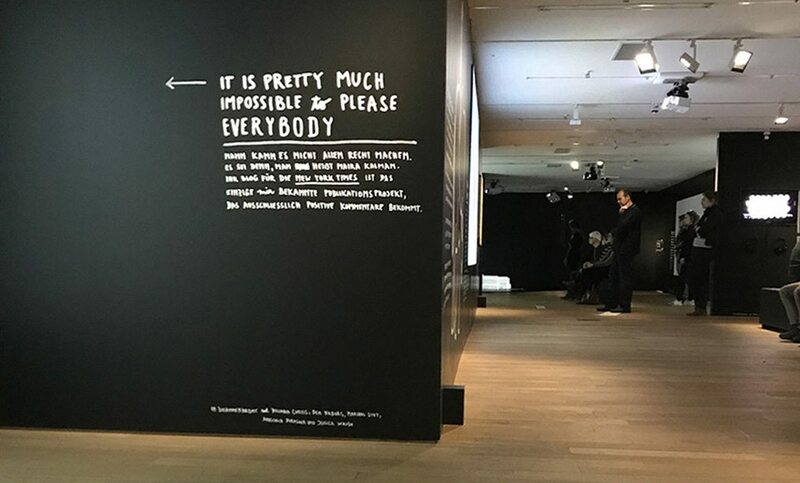 Analysing the exhibition closer, I feel it was more of a journey of self-discovery for Stefan Sagmeister and I applaud him for putting the exhibition together to illustrate a collection of findings. 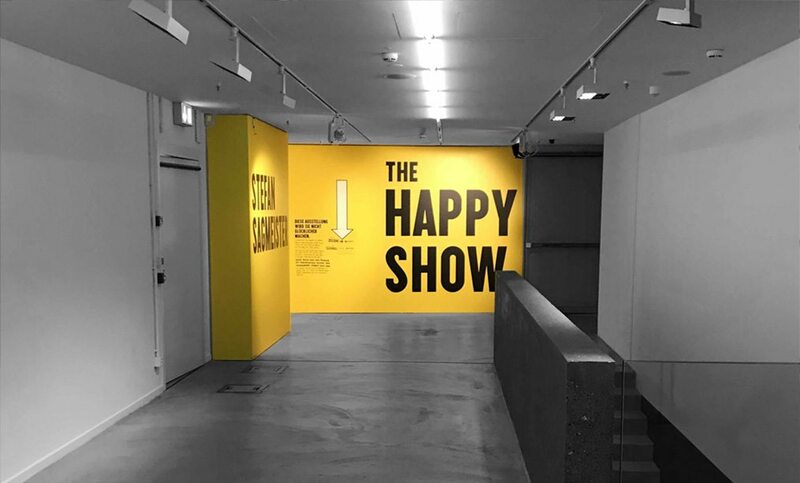 The exhibition certainly made me think about what I consider ‘happiness’ and realised that this required context: happiness in a ‘design’ context/happiness in a personal life context. I learnt that my design work could be a great source of happiness if time was allowed to produce content which did not necessarily pay my bills. So here my January resolution: To produce design work that is ‘other’, to produce stuff that makes people smile. And I am grateful for that inspiration. Once outside, I suddenly remember that earlier in the day I had purchased a timely ‘Fasnachtschuecheli’. As as a ‘Swiss abroad’, I realised that this little pack filled with nostalgia and loaded with childhood memories was my real happiness for this moment in time. And so I embarked on creating a little installation myself, by eating a little piece of happiness on a tram stop outside a design museum. If only it were that simple. blog.wohlgeraten.de Blog: Museum für Gestaltung in Zürich – „Happy Show“ für Design-Fans.